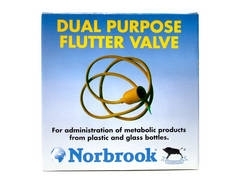 Rubber Flutter Valve and Needle. 13g. 1.5 inch. Flutter valve apperatus for injection of sterile solutions into the vein or under the skin. Complete with injection needle and silicon tubing, fits glass and plastic bottles.